Hurricanes stalling and falling apsrt as they reach the coast. As I heard a million times last year after Harvey, is this the new normal? Is it falling apart though? It looks like it is going back to the coast now, over Wilmington. Hurricanes stalling happens mostly over water, or even reverse or even do a loop, as they work there way through the steering effects of high pressure ridges etc. Sadly, more people died in Puerto Rico. I don’t want to diminish the terrible impact of Maria. However, the data analysis is fundamentally flawed. The time series of death rates have been trending up in PR since 2010. The authors of the study should not have used the mean value of an upwardly trending series as a basis for analysis. This is really a very rookie mistake in statistical analysis. Do you know George C. Scott? The only thing left for them to blame Trump for is if the storm stalls and dumps 15-20 inches of rain. Weather channel is calling it a cat 1 at 90 mph as of 7:35 AM at 5 E of Wilmington. We had that much rain in Boulder this week five years ago, and we are 900 miles from the coast. 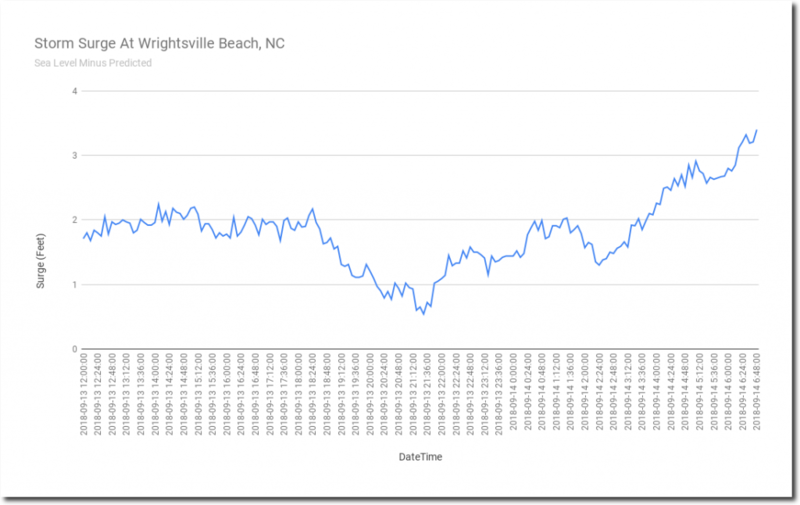 Who needs actual wind speed data, when you have propaganda to sell? We get that much rain all the time here in Tennessee! … all the freaking time! Over the last two days saw the Hurricane get weaker and weaker as it approached the coast, last night before I went to bed, it had dropped to 100 mph with indication that it would drop some more before making landfall, which means at best a Category 1. The overblown hype was silly since I KNEW from 3 days ago that it would weaken a lot before making landfall as it was entering cooler waters near the coast. This is exactly what a “Category 6” hurricane looks like folks! BTW, if anyone ever tells you that we are adding a category 6 hurricane, or a category 6 tornado (F6), don’t believe anything else that comes out of their mouth. You cannot have a category 6, as these things are measured on the amount of destruction, not wind speed. Category 5 is already total destruction. A category 6 would be like total, total destruction .. or something .. or perhaps just we see with Florence .. a big nothing burger without fries and nothing to drink. Florence threatens to kill thirsty innocents deader than dead. Y’can’t write stuff like that! It just marks you for trouble when bodies start showing up (due to other individuals’ actions). But how can they categorize hurricanes before the hurricane has destroyed a single thing? Florence registered a handful of 100mph+ gusts, Lookout Point 106mph. 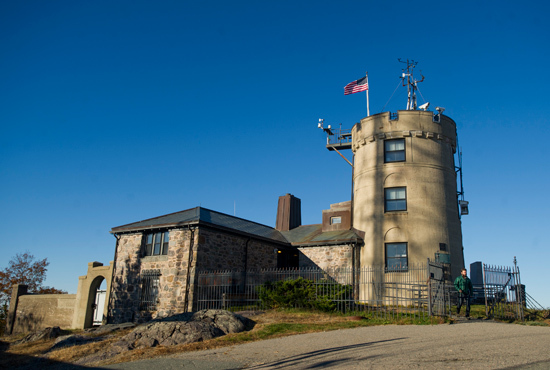 This is a reminder that the 1938 Long Island Express Hurricane broke the anemometer after it recorded a 186mph gust at Blue Hill Observatory (below, which is built like a fortress). 186mph is still the highest gust ever actually recorded in a hurricane. Blue Hill Observatory is just south of Boston, 120 mile NE of where the 1938 hurricane made landfall…Think about that. 1938 LIE blew holes in Long Island and created new harbors. 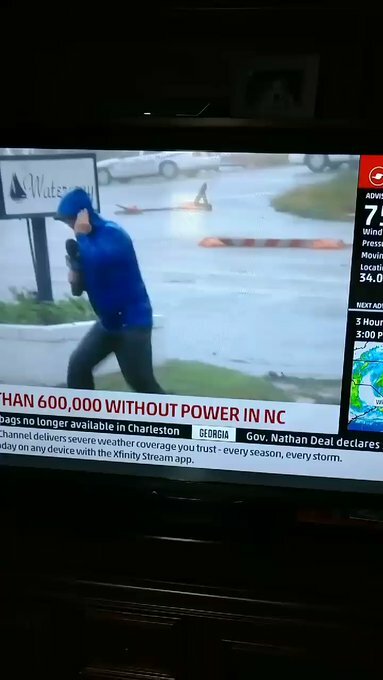 It would have surely killed these idiot reporters out in the storm. We have a serious “cry wolf” problem brewing if we ever get a REAL hurricane…you know the kind with hurricane force winds. The media is trying to find every tree branch on the ground or bending palm tree or reporting any power outage to prove it is a once in a lifetime storm. You mean, like Crack News Network? Florence is basicly the new moses. There are twigs down! There are puddles! I’ve seen summer showers that looked more impressive. 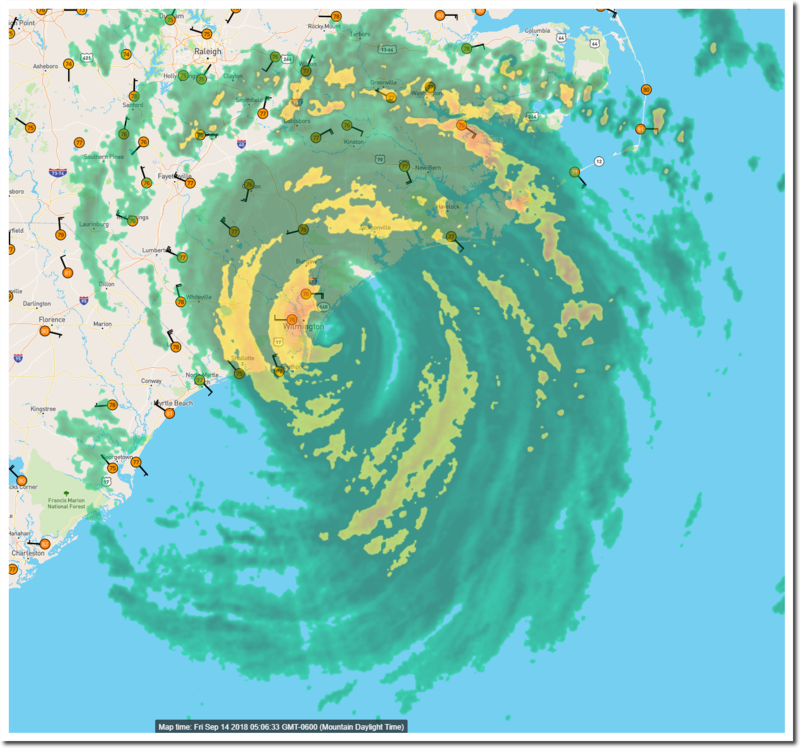 The storm is in fact pounding Wilmington, NC and surrounding areas right now, with heavy rains, winds, and flooding. Much more than a few twigs and puddles. But to me, the main message here is that this is a normal hurricane which is hitting the east coast at a normal time of year with expected impacts. Nothing about the storm is “historical” or “unprecedented” (with many similar, even stronger, storms having occurred in the same area over previous decades and centuries). 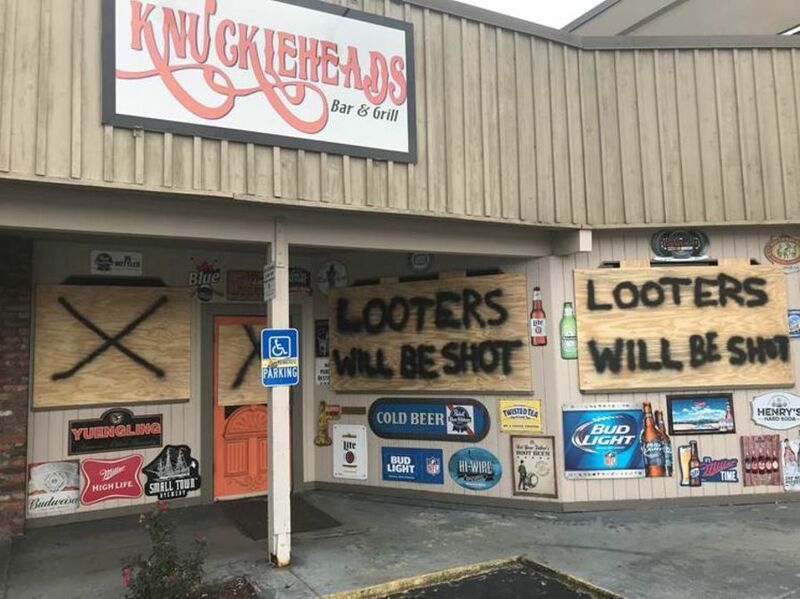 There will be devastated areas of NC that need assistance for months after, but fortunately FEMA and state/local agencies are prepared and will deal with the effects, along with the many selfless individuals and families who will generously give their time and money to assist with the recovery. As of today Wilmington has become an island and all roads leading in to the city are flooded. River levels are still rising, as RAH said “they have dodged a bullet” because it could have been much worse. I certainly wouldn’t want to live where ‘summer showers are more impressive’ than this! Alarmist’s article methodology: Fake News. Florence could have been much worse. It encountered shear coming out of the south on Wednesday that caused the eyewall to become less defined and the eye to never clear completely. It just did not have time to tighten the eye and regain it’s organization. Also where it came ashore the NE quadrant where the storm surge is most severe was north of the area where the shore is concave. Had it come in a little further south storm surge would have been much worse. Still not a storm to laugh about. Serious stuff. But obviously not nearly as bad as it easily could have been. As bad as it is, they dodged a bullet. 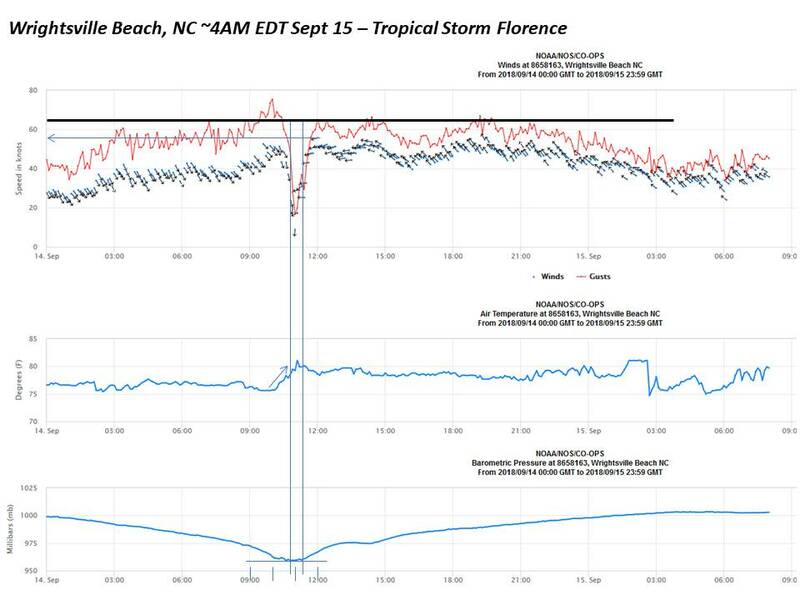 Florence never registered a sustained hurricane force wind. 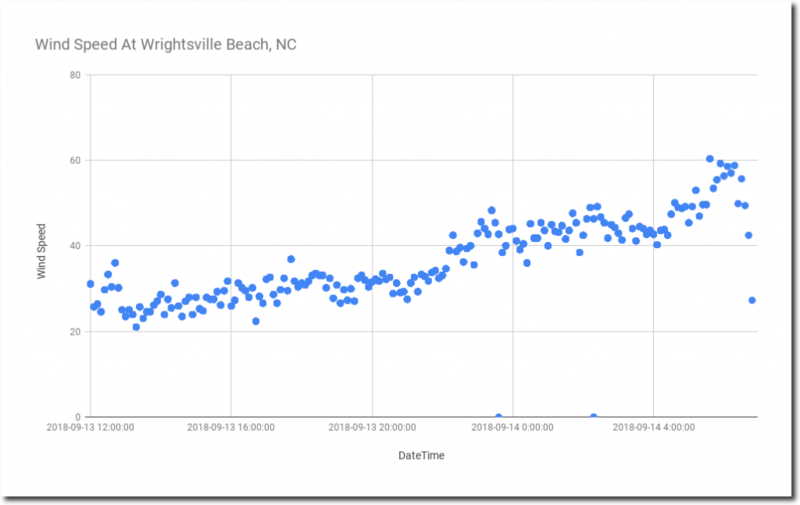 The eye passed directly over Wrightsville Beach…was there for 40 min. Wrightsville NOAA station recorded max sustained winds of 56 knots or about 65mph…It wasn’t even close. Only the eyewall had gusts over 75mph up to 85-90mph, but they were gusts not sustained. Wrightsville and Beaufort to the NE recorded a storm surge of 5 feet maximum. The forecast and public were told it was 7 to 11 feet. It was half that. 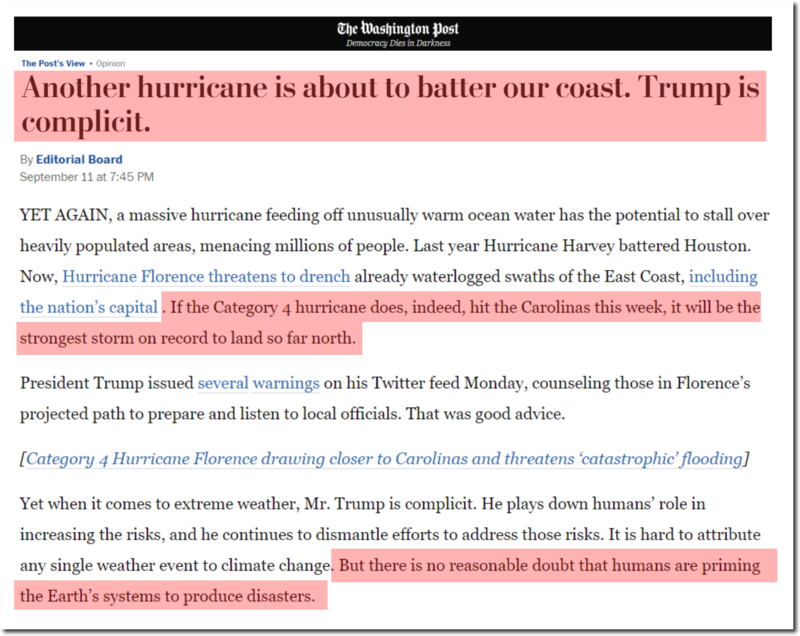 Something is seriously wrong with our hurricane weather system which is apparently designed to feed TWC and CNN and NYT…rather than honestly inform the public about impending potential disasters. If we ever have a real hurricane, especially a major one like those in the past, it will be a devastating situation compounded by the cry-wolf syndrome which is storm after storm being reinforced.